The William Simpson Elkin Cancer Lectureship Endowment, established in 1979, is one of two ways that the Nell Warren Elkin and William Simpson Elkin Foundation has made an impact on Winship. For the past 38 years, Winship clinicians, researchers, residents, and fellows have gathered weekly throughout the academic year for the Elkin Lecture series. Speakers from around the country provide in-depth information about cancer topics in basic research. The William Simpson Elkin Cancer Lectureship Endowment, established in 1979, is one of two ways that the Nell Warren Elkin and William Simpson Elkin Foundation has made an impact on Winship. 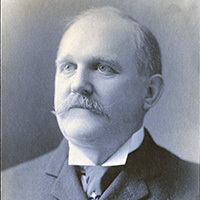 William Simpson Elkin, MD, was dean of Emory's School of Medicine from 1915 to 1925. In 1982, the Nell W. and William S. Elkin Fellowship in Oncology Endowment was established at Winship to honor the memories of the three sisters of Nell Warren Elkin. Over the years, the Elkin Fellowship has proven critical to supporting some of the brightest young minds in the field of cancer. Sagar Lonial, MD, Winship's Chief Medical Officer, was an Elkin Fellow from 1997-2000. In 2016, Lonial was named chair of Emory's Department of Hematology and Medical Oncology and is recognized internationally for his contributions to myeloma research and patient care. Photo of William S. Elkin: Health Sciences Center Library Photograph Collection, Woodruff Health Sciences Center Library, Emory University.